How Far is Bhaggyam Pragathi? Pragathi is a unique residential project that brings back the joy of living together as a community while still retaining individuality, personal space, blend of contemporary living coupled with peace, harmony, and warmth that are the hallmarks of our culture. Bhaggyam Pragathi offers Ready to Occupy Compact 1BHK Flats with 8 different carpet area for sale in Karapakkam, Well planned 2BHK Apartments and Spacious 3BHK Apartments developed by Bhaggyam Constructions available for sale in OMR, Chennai. 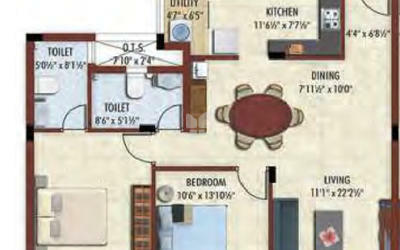 The magnitude of an area included in this property vary depending on the number of BHK's. 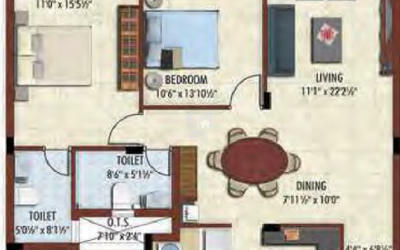 Bhaggyam Pragathi is spread over an area with many floor Classifications. 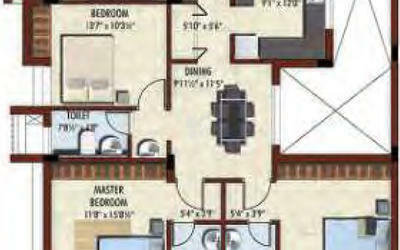 The master plan of Bhaggyam Pragathi is designed in such a way that these Apartments comprises of wide space with proper ventilation at every corner of the house. 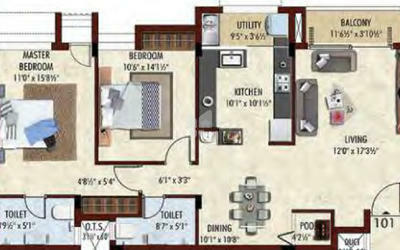 Bhaggyam Pragathi one of the well-planned projects offers apartments for sale in Karapakkam, OMR, Chennai. With a quiet view of the beautiful village pond, its location is ideal for those looking for peace and quiet away from the maddening city. Bustling with life yet innately calming, Pragathi offers all the world-class amenities to lead a life of comfort while enjoying the warmth of living with friends and family. Bhaggyam Pragathi is located on the nearest IT Expressway at Karapakkam, opposite PayPal and a stone’s throw from Accenture and other leading IT companies. OMR one of the places where many IT Hubs and residential hubs are located close by. The locale is much easier to commute inside and outside the city. Get your dream home in OMR Where many flats are available for sale which are both affordable and with luxury amenities for sale. Pragathi is a CMDA approved project under Chennai Corporation limits and is designed keeping in mind one need to create a balance between work and home. 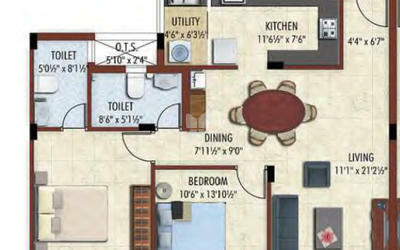 The apartment gives the clear picture of life and serenity that pleases every resident. Away from city chaos, the project gives a peaceful stay to its residents. 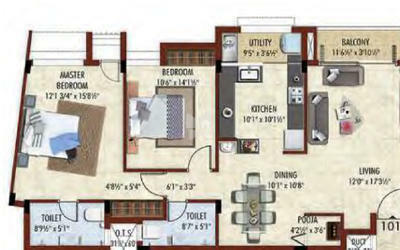 The project offers a decent number of amenities needed to satisfy a Gated community Such as Gym, Rainwater harvesting. brick wall with Raft and Pile foundation. Main Door : Teak Wood frame with Teak wood Paneled shutter. Painting : One coat of primer and two coat Putty and two coats of Emulsion Paint. Electrical : Legrand Myrius or equivalent make switches. 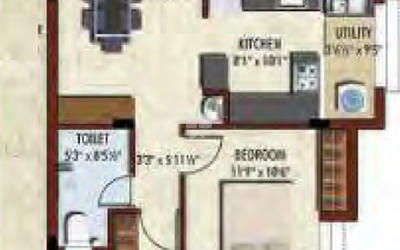 Provision for electrical points for Modular kitchen. Sanitary fittings : Diamond / equivalent make single bowl stainless steel sink. Plumbing : CPVC & UPVC pipes, CP fittings with Jaguar /equivalent make taps & fixtures. Electrical & Telephone points : Legrand Myrius or equivalent make switches. 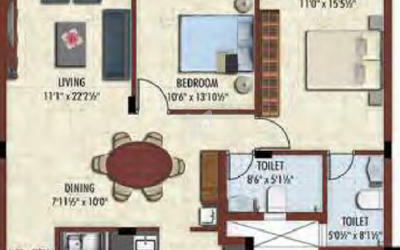 Provision for AC points in all bedrooms and provision for telephone point in Master bedroom. Flooring : 300 x 300 Somany / equivalent make antiskid ceramic tiles. points next to wash basin. Sanitary and Bath fittings : EWC and wash basins in all bathrooms of Kohler / equivalent makes. Plumbing and CP fittings : CPVC & UPVC pipes and taps,shower head, health faucets, hot and cold mixer for shower fitings of Jaguar/equivalent make. Provision for geysers. Door : Teak wood frame with plain glass framed french door shutters. Flooring : Anti skid ceramic tiles of Somany / equivalent make. Balcony parapet : MS grills of simple design upto the height of 2’6” from the floor. Wall tiles : Ceramic wall tiles with 5ft. Wall dado matching the Kitchen of Somany / equivalent make. Inverter Provision : All flats will be provided with provision for Power Inverter. Lobby Flooring : Ceramic tiles of Somany / equivalent make. Staircase : Granite steps with hard wood rails and MS grill balusters of design specified by the Architect. Carparking : Granolithic finishing over a bed of PCC flooring. Driveway & other external areas : Inter Locking Paving Blocks as specified by the Architect. Sump : Sufficient number of sumps will be provided as per CMWSSB standards. Overhead Tank : Of adequate capacity as per standards andcomprising of two compartments with provision of draw from sump into one and from auxiliary source like bore well in to other at every block. Name board/Letter box : Will be provided at the entrance lobby of all the blocks. Compound wall : Will be provided on all sides, retaining existing walls if any. Roadside wall will be built to design as specified by the Architect. Security Cameras : Common areas, entry & exit gates and lobbies will be monitored by CCTV camera facility. Bhaggyam Constructions is a renowned Real Estate developer known for its construction with an ace quality. They build apartments for those searching for their dream home and have an eye for details along with have responsibilities to strengthen the environment. 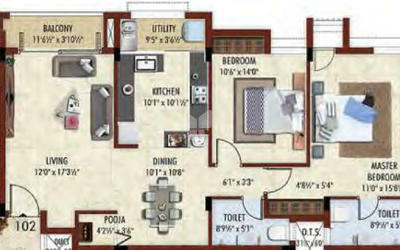 Bhaggyam Pragathi one of the under-construction project by the builder being developed with compact 1 BHK’s well planned 2BHK’s and spaciously developed with 3BHK flats for sale in Karapakkam, OMR, Chennai. Bhaggyam Sundari one of the masterpiece of the builder which offers Ready to occupy 3BHK Apartments for sale in Mylapore, Chennai. Bhaggyam Adikar one of the another under construction project by the builder being developed in a vast area of land offering 2,3 BHK Apartments for sale in Mylapore, Chennai. 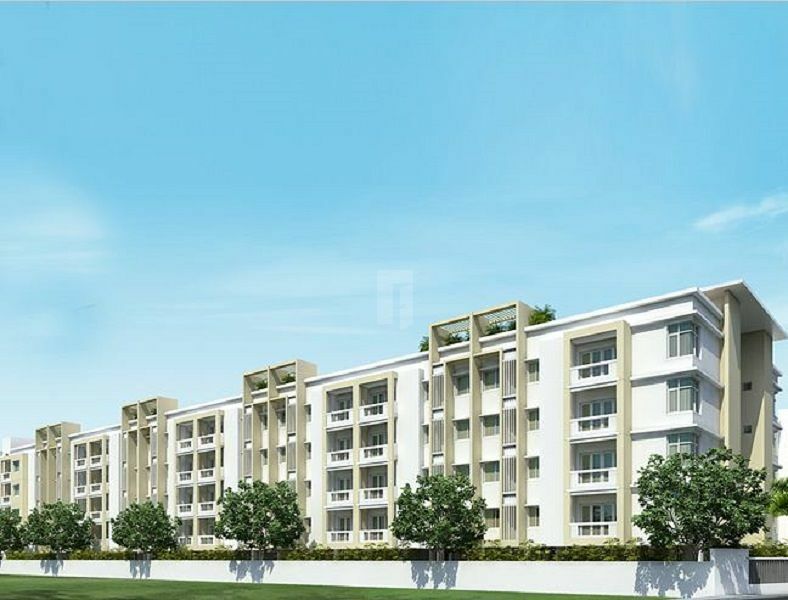 Bhaggyam Sadhana one of the project which offers Ready to Occupy 3BHK Apartments for sale in Pallavaram, Chennai. Their policies for inspecting the environment aspects over their business is the priority number one. This is truly no compromise on quality, because they work in conjunction with all the architects, project managers, subcontractors, suppliers and those promisingly involved in the project.